The Genesis Walker is the lightest full shell pneumatic walker on the market. It has been computer engineered to provide strength where required while eliminating extra weight. Similar to popular athletic shoes, the Genesis Walker uses a dynamic air chamber in the heel of the tread which actively absorbs the shock of the heel strike and allows for a more comfortable walking experience. 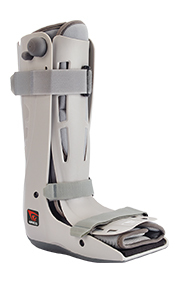 For more information on the Breg Genesis Full Shell Walker click here.